Eye drops are a commonly used treatment for hay fever and are a welcome relief for those who suffer from the itchy red and inflamed eyes that occur as a symptom of hay fever. In particular, bloodshot eyes can be very socially distressing and the more a person rubs his or her eyes, the more irritated the eyes become. Red eyes can detract others from your work while leaving you embarrassed and in discomfort from the irritation. There are eye drops that are geared for generalized relief of red or dry eyes, regardless of the condition triggering the pain. Brands such as Visine provide artificial moisture to the eyes and are helpful if you suffer from dry eyes, particularly if you find you are rubbing them often in attempts to manually relieve the irritation. These types of eye drops are quite cheap but shouldn't be used too frequently, or you can suffer a rebound effect, where your eyes are dryer than they initially were prior to use of the eye drops. You can keep these eye drops on hand for occasional use, particularly if you have social or professional engagements and want to relieve dryness and redness. Antihistamine eye drops often include the drug called levocabastine and work well to relieve the irritation hay fever sufferers experience in their eyes. The drug tends to begin working within ten to fifteen minutes of application and works by blocking action of the chemical histamine that is released during an allergic reaction. Your inflammation should be reduced or eliminated, providing effective relief. Although levocabastine is no longer available in the United Kingdom, you may find it in other locations. The drugs cromoglycate and nedocromil are used in eye drops to treat hay fever. Cromoglycate works to stabilise the mast cells, which are an important feature of the immune system. When exposed to an allergen, mast cells become activated and respond by releasing histamine, which then causes inflammation as part of your body's response to fighting the allergen. Both cromoglycate and nedocrimil are considered highly effective drugs, although they can sting a bit when first applied. Your eyes will likely tolerate the application better after a few uses. These drugs also tend to work best for seasonal allergies and can be used as preventative mechanisms or as treatment after eye hay fever symptoms appear. They do not contain steroids and they are often used if an antihistamine eye drop product has not provided sufficient eye relief. 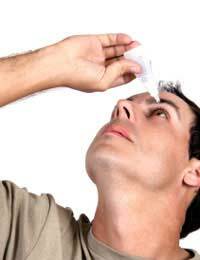 If you wear contact lenses, it is generally recommended that you don't wear them when treating with eye drops. This is particularly true for wearers of soft contact lenses; preservatives and other ingredients in hay fever eye drops can be absorbed by the lenses and subsequently may cause irritation. It's also important to note the expiration dates because eye drops tend to have fairly short expiration dates, especially once opened. Once you have taken the drops, your vision may blur but this is only temporary and will resolve. Red, inflamed and irritated eyes are not only painful but also socially embarrassing because they alert the world to your hay fever symptoms and detract others from your work and personality. Talk to your doctor or pharmacist about the different eye drops available and you can find the ones that work best for the frequency and severity of your hay fever symptoms. You shouldn't have to suffer from painful eyes and once you find a treatment plan that incorporates the right eye drops for your discomfort, you can get back to clear, healthy and painless eyes.